Basically, Joe Crowley is just a hack politician from the Queens County of yesteryear, when it was an Irish and Italian enclave that still supported Republicans and conservatives. Queens is very different today but Joe Crowley-- ironically, still the Democratic Party Machine boss for the county-- may know it intellectually but doesn't experience the change, since he and his family live in Virginia. His district, NY-14, includes Rikers Island and La Guardia Airport but the neighborhoods in Queens where the voters live are in Woodside (home to immigrants from Latin America and Asia), Sunnyside, Corona (once home to Louis Armstrong, Duke Ellington and Malcolm X and home today to immigrants from Ecuador, the Dominican Republic and Asia), Jackson Heights (Little India), Steinway, Ditmars, East Elmhurst, College Point and Malba. It's like the welcoming, colorful melting pot that the Lower East Side once was, an engine of future American growth and innovation. The Bronx portion of the district includes half of the Bronx Zoo plus the communities where the voters live: Throggs Neck, Edgewater Park, Locust Point, Silver Beach, Eastchester Bay, Parkchester, Baychester, Pelham, Spencer Estates, City Island and Middletown. The district is 47% Latino, 25% white, 17% Asian and 10% black. NY-14 is one of the most dependably blue districts in the country. Obama won with 76% in 2008 and with 80.7% in 2012. Hillary beat Trump there with 77.7%. The PVI is D+29 and Republicans don't usually even bother contesting the district. Crowley hasn't ever had any kind of a real challenge... until this cycle. Not even when he first wormed his way into the seat. Last summer, the Village Voice reminded New Yorkers how Crowley came to "win" the seat originally. Short version: Crowley was selected-- different from elected-- congressman in a very sleazy backroom deal with his predecessor, Tom Manton, who announced his retirement after the filing deadline and then, as head of the Queens Democratic Party, handed Crowley, a former staffer and a crony, the Democratic nomination. In the summer of 1998, Tom Manton of Queens shocked the city’s insular political world by announcing his retirement from Congress. Manton, 65, had petitioned to get on the ballot and showed all signs of wanting to run for another term. Aging politicians in his shoes usually said publicly, much earlier in the primary process, they weren’t running again and endorsed a favored successor. Even in machine-driven New York, this was how the game was played. But Manton, the chairman of the Queens County Democratic Party, was a county leader par excellence. He wasn’t about to allow something like democracy to break out in his borough. By waiting so late to make his announcement, Manton ensured only one elected official could compete in the Democratic primary to replace him. Since petitions had already been circulated, a candidate needed to be picked by a committee within the Queens Democratic Party that, of course, Manton exercised absolute control over. The committee met secretly, not allowing other elected officials to submit their names for consideration. By 11 o’clock on the morning of July 22nd, 36-year-old Joe Crowley, the newly-minted Democratic nominee, was on his way to Congress. Politicians in Queens were aghast. Manton didn’t care. Crowley, then an assemblyman, was his protégé, and he would eventually hand over the Queens Democratic machine to a man he treated like a son. When Manton died of cancer in 2006, Crowley became county leader. Not content to just rule the roost in Queens, Crowley climbed his party’s ranks in Washington. Today, he is chairman of the House Democratic Caucus, the fourth-highest ranking position in the Democratic leadership. He is whispered about as one potential successor to Nancy Pelosi, the House Democratic leader. Before Crowley can get on with his ladder-climbing, he needs to do something somewhat unfamiliar: run a campaign. For the first time since at least 2004, he will be forced to compete in a primary in the overwhelmingly Democratic district spanning northern Queens and a chunk of the eastern Bronx. Since Republican victories are all but impossible, the primary is where the action is-- and where Alexandria Ocasio-Cortez, a 27-year-old former organizer for the Bernie Sanders campaign, hopes to pull off her historic upset. ...While the Sanders wing of the party has derided much of the Democratic establishment as too beholden to the status quo, it’s hard to find a congressman more representative of that establishment than Crowley. The Blackstone Group is his second most prolific donor. Bank of America, Verizon, and Tishman Speyer, the powerful New York real estate developer, round out the top 20. He was an unflinching Hillary Clinton ally. Like many in his party, he supported the Iraq War and the Patriot Act. Once Crowley got into Congress, he immediately gravitated to the Wall Street-owned and very conservative New Dems, eventually becoming their chairman. He was even anti-Choice. Once he decided to start climbing the leadership ladder, eyes set firmly on the speakership, he "changed" his positions to a more conventional Democratic agenda. Suddenly he was pro-Choice and willing to vote as a garden variety Democrat instead of always backing the Republican wing of the Democratic Party. I spoke to several progressive congressmen off the record-- everyone is afraid of him-- who told me "a leopard doesn't change his spots" and that "what drives him is greed and corruption... he'll say anything, whatever it takes to claw his way to the top." This is a guy who's only notable contribution in his decade in the state Assembly was to sponsor a bill to require public schools to teach students about the Irish potato famine. When we discuss the future of the Democratic Party-- and the future of America-- we have to talk about the foundational way in which our politics must change. We must be unafraid to advance ambitious legislation that puts working families first, that takes care of our elders, and champions economic mobility-- the basis of the American Dream. In order to accomplish that, we have to have the political courage to stand up to the lobbyists and powers that advance business as usual. We must be willing to buck convention and reject the influence of big pharma, defense contractors, and billion-dollar corporations that have profited off the despair of working Americans. 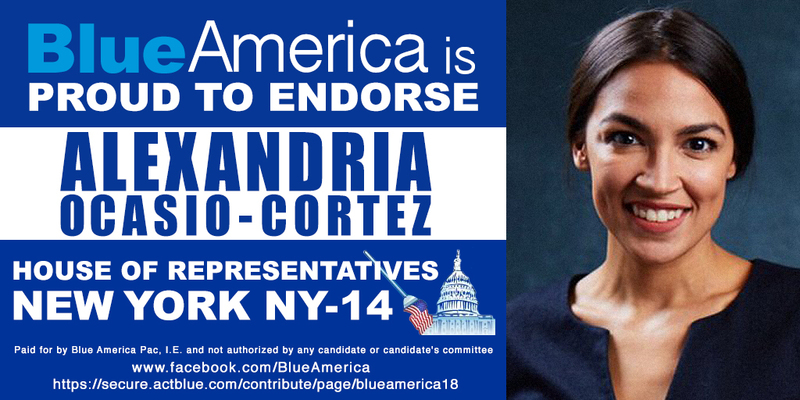 I am running for Congress because NY-14 has gone far too long without proper representation. Our community, one of the most diverse in the nation, is not being heard. A sea-change is happening right under our feet. People are demanding a future for their children, security in their healthcare, protection from superstorms, and true, full-throated advocacy for the policies that will make it happen. That’s why I have chosen to run without a dime of lobbyist funds-- and on an ambitious platform that has included Medicare for All, Tuition-free College, a Federal Jobs Guarantee, and more. Winning this race would not only mark a massive change in New York politics, but it would create the space necessary for a progressive surge in Congress, where we need it most. 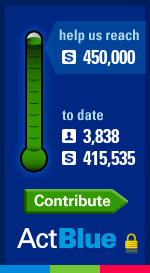 Please consider clicking on the Blue America thermometer on the right and contributing what you can to an all grassroots campaign that knows how to make every cent count. Alexandria is another candidate like Jenny Marshall in North Carolina and Kaniela Ing in Hawaii and Katie Porter in California who can help make real and fundamental changes to a very broken Congress, a corrupted and nearly useless institution that needs to be fixed before it can do anything to stop Trump or anything to help our country. Wall Street puppet Joe Crowley, given the chance, will make that much worse, not better. Money bomb the NRA/ILA TODAY if you care about your gun rights. Now we get to endure NRA Spam???? How long before the Nigerian princes show up? What can one do to stop the evil and vile DCCC from interfering with the prospects of yet another promising progressive? Rahm saw to it that he didn't have a progressive running on his Chicago turf, and Texas isn't yet a done deal. PA-18 will likely continue to victory, but how much of a Republican will actually be elected (just like with Doug Jones of Alabama, who seems to not miss a chance to vote to support Trump)? And this is the Party too many still think can be reclaimed from within? The democrap party is already owned by wall street. Obamanation took their money lustily in exchange for vowing to not prosecute one single person for $20 Trillion in fraud. They won't miss a payment. Crowley is irrelevant. The democraps have proved that once they got bought they've stayed bought. The only thing wall street has to fear is whether some other corporate sector pays a bigger bribe for something wall street cannot abide. 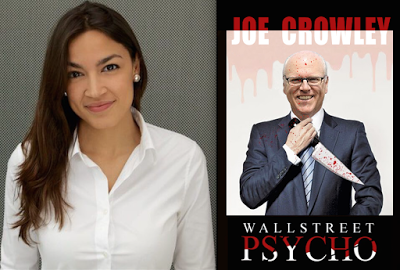 Crowley won't lose, but even if he did, there are scores more in line behind who will lustily take his place as wall street bagman/woman. To fix a party consumed with greed you'll need to find an impulse stronger than greed to which to appeal. And all the ones in the same zip code as greed are just as despicable (lust, fear, hate). LBJ thought that passage of altruism for brown people would lose the Democrats the south for a generation. He was correct, but vastly misunderestimated. The Democrats lost out to the democraps for all eternity. Bill Clinton (DLC) saw to that.